TV show dates: September 23, 2015 — March 19, 2019. Performers include: Caitlin Barlow, Katy Colloton, Cate Freedman, Kate Lambert, Katie O’Brien, and Kathryn Thomas. A single-camera comedy, this TV show is based on a web series of the same name from The Katydids, an improv group. The six members both star in and write the series. The show revolves around six elementary school teachers who are trying to mold young minds — but their own lives aren’t really together. 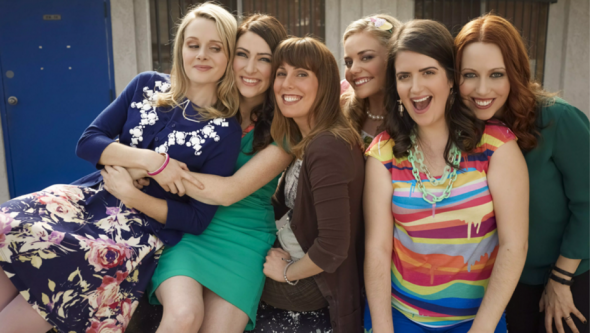 The educators are politically-correct vegan Cecilia Cannon (Caitlin Barlow), insecure Chelsea Snap (Katy Colloton), oddball AJ Feldman (Cate Freedman), hopeless romantic Caroline Watson (Kate Lambert), naive and gullible Mary Louise Bennigan (Katie O’Brien), and dark yet needy Deb Adler (Kathryn Renée Thomas). Trying to keep them in line is exasperated Principal Pearson (Tim Bagley). It’s Ms. Bennigan’s wedding day, and everything that can go wrong does; the teachers scramble to save this hot mess of a day without Ms. Bennigan finding out. What do you think? Do you like the Teachers TV show? Do you think it should have been cancelled or renewed for a fourth season? I am very sorry to see “Teachers” cancelled. It is a funny & unusual show. Hopefully it will be picked up by another network.